From September 2018, schools were required to publish information on their websites around safeguarding. The details of this can be found in our School Website Requirement Guide. Anyone who works in education will be all too aware of their responsibility to safeguard children in their care. This applies to governors, headteachers, Designated Safeguarding Leads (DSL's), teachers, teaching assistants, welfare staff, site management and anyone else who spends time with children. If you work in education and have daily contact with children, you are well placed for recognising early signs of potential issues. Section 175 of the Education Act 2002 sets out a requirement for schools – including nurseries, early years, and further education providers – to make arrangements to safeguard and promote the welfare of children. Furthermore, Ofsted places safeguarding at the centre of any inspection. Ineffective safeguarding can put your school immediately into special measures. Staff should be trained effectively and encouraged to develop a culture of safeguarding in your setting. In schools, you must create an environment where children feel safe to learn, play, and grow. Children should feel comfortable in their surroundings and know that they can approach you with any problems. Here at Schudio, we often find common errors on school websites when doing our Pro School Compliance Audits . So let's look at some of those errors and how to not succumb to them. #1 Out of date policies. An often overlooked issue but a quick fix. Many schools are great at updating policies and printing a copy to put in a policies file. However, they are not so good at remembering to put the updated version on their website. I recently heard of a story whereby an Inspector arrived at a school prior to starting an inspection and immediately raised a safeguarding concern. This wasn't in relation to a specific complaint or procedure - it was because the policy wasn't up to date on the school website. The Inspector was swiftly provided with a paper copy and the website updated! #2 Not knowing where your safeguarding information is on your website. Documents and policies buried in the depths of your school website is not good practice. It is vital that you know exactly where your policies sit on your website. Good practice suggests that you have a specific policy page with policies listed alphabetically. It's also good practice to make sure that your policies are 'readily accessible' . This means not having to download a file but being able to read it in the body of the webpage. If you have a website that has lots of sub-menus, it might be a good time to give your site a spring clean. If you wish to develop a culture of safeguarding in your setting it might be a good idea to add a safeguarding link to the top menu of your site. Many schools are adopting this idea to show the importance that they place on safeguarding. #3 Policies in more than one place. Another common error is schools having policies in more than one place around their website. You might have a copy of your Safeguarding policy on your policies page and also on a safeguarding page. It is vital that if you are a school that has more than one copy of your policy dotted around your website that you check that they are all the correct version. If this resonates with you, we have a piece of software that allows you to group policies together and drop them around your site and only update the policy once. They've gone over and above on the content by broadening the requirements but what a fantastic approach. The important thing to remember is just how important safeguarding is within schools. Your website should demonstrate how seriously you take this key area. It should make clear who is responsible and provide a safe route for raising any concerns. It should also be reassuring to parents that you place the care of children at the top of your agenda. Now it's time to go grab a coffee and check your website is compliant and ensure that your policies are current and up to date, you know where all the statutory information is online as well as offline and if you have policies in more than one place they are all the same. If you haven't got a specific safeguarding top level menu why not add one and create a specific page safeguarding. 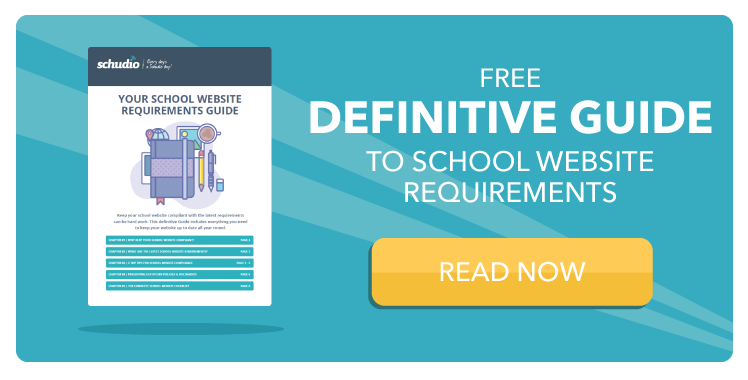 To ensure you're fully compliant, check out our School Website Requirements Guide.